Glen Ord Distillery stands close to the A832 on the north western edge of Muir of Ord. As you turn off the main road your first impression is of the industrial presence of the neighbouring Glen Ord Maltings, but as you enter the visitor car park the beautifully cultivated gardens that surround it bring things back to a more human scale: and are your first hint that here is a distillery that goes to a lot of effort to give its visitors the best possible experience. The visitor centre occupies the southern end of the long run of stone warehouses which overlook the car park. To reach it you walk around the end of the building, and as you do so you get an excellent view of the large stillhouse, set at an angle at the far end of the site and offering a view of the stills through its huge windows. The opposite side of the minor road here carries a wooded embankment which at times can be a riot of wild flowers. The visitor centre at Glen Ord is one of the best designed and best laid out (and one of the most spacious) of any distillery in Scotland. 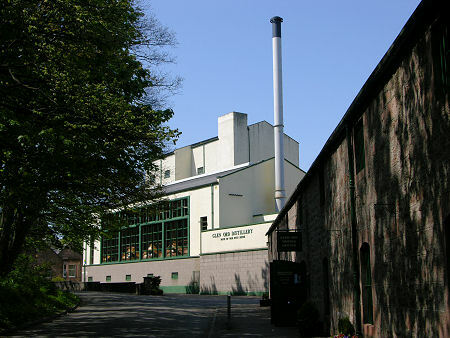 Visitors can opt to tour the visitor centre exhibition only, or additionally tour the distillery. We'd recommend that if time permits you do both, but it has to be said that the visitor centre is so good that a visit to it is a worthwhile experience in its own right. It comprises a well stocked and attractive shop, a spacious tasting room with a viewing window into the bonded warehouse, and an excellent exhibition. 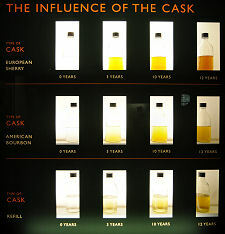 The last of these includes informative displays on subjects like cooperage and the effects of different casks on the appearance of the contents, plus an audio visual presentation. The distillery tour at Glen Ord Distillery allows most of the key stages of production to be viewed. You can find out more about Making Malt Whisky from our series of feature pages showing the stages in the process. 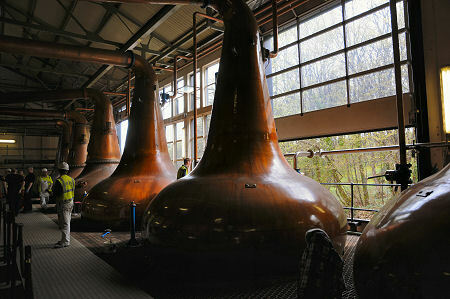 The distillery retains two pagodas, often regarded as the "signature" feature of a distillery. Almost all distilleries originally had their own kilns, topped off by pagodas, which dried the malted barley. 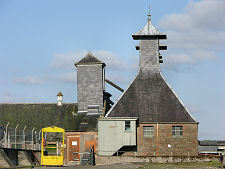 Most distilleries now buy in their malted barley from industrial maltings, with the result that many surviving kilns, and their pagodas, are disused. The malted barley used at Glen Ord Distillery comes from the neighbouring maltings, which also supplies a number of other distilleries. When we visited the mash tun had just been replaced, a process that had required the removal of part of the roof, and had a silky steel finish. At the same time some of the eight Oregon pine washbacks had also been replaced. Like icebergs, washbacks are mostly beneath the surface, and at Glen Ord their considerable height can be glimpsed through the mesh of the floor. The heart of any distillery is its stillhouse. As already noted, the stillhouse at Glen Ord is fronted by huge south facing windows which allow the stills to be seen from the outside: and which also illuminate the interior. 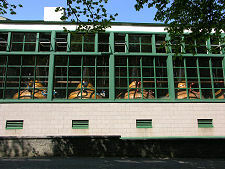 Immediately behind the windows is the row of six stills, with little apparent difference in size or shape between the wash stills and the spirit stills. 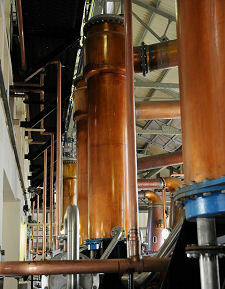 The lyne arms carrying the distilled liquors away from the stills pass high overhead the main walkway to the condensers, which stand vertically in a row towards the rear of the stillhouse. "Ord Distillery" as it was then known, was visited by the author Alfred Barnard when he was researching his definitive book on distilleries between 1885 and 1887. The distillery's entry in "The Whisky Distilleries of the United Kingdom" runs, unusually, to three pages, and you get the impression Barnard thoroughly enjoyed his visit, perhaps because he found the 1882 spirit he was offered "very agreeable to the palate". You get the feeling from his description and from an illustration in his book that Barnard would have some difficulty recognising today's Glen Ord Distillery, though he would doubtless still have enjoyed the product! It was the MacKenzies of Ord who founded what became Glen Ord Distillery. 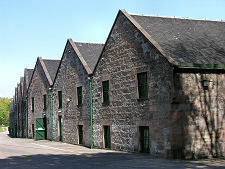 Thomas MacKenzie of Ord inherited the estate in 1820 at a time when what was known as Mill of Ord had a reputation for the illicit whisky distilled here. The MacKenzies had been landowners in the area since being granted estates by King Alexander III in 1263, and Thomas MacKenzie's aim in developing a legal distillery was to provide a rapid means of adding value to the barley produced on his farms. Ord Distillery Company opened in 1838 and amongst other associated developments a piggery was established nearby to make good use of the by-products from the process. When it originally opened the distillery had two coal-fired stills, and power for other aspects of its operation came from two water wheels. Water for mashing was drawn from a well. By the time Alfred Barnard visited, Ord whisky was exported to places as far afield as Singapore and South Africa and the distillery continued to thrive throughout the 1800s, being sold in 1896 for £15,800 to the Dundee based whisky blenders James Watson & Son. Like many other distilleries, Glen Ord was closed during the World War One. In the 1920s it was sold to Thomas Dewars & Sons, and it later became part of Scottish Malt Distillers. Another temporary closure took place during World War Two. The post war years saw a series of upgrades and expansions. Electricity first came to Glen Ord Distillery in 1949. In the late 1960s the two coal fired stills were replaced by the current complement of six steam heated stills, and the floor maltings at the distillery were closed when Glen Ord Maltings were developed nearby. The distillery became part of Guinness in 1985, and in 1997 this became part of Diageo. The visitor centre opened to the public in 1994. Muir of Ord, IV6 7UJ.